On November 11th, Karen Nyberg, Fyodor Yurchikhin and Luca Parmitano returned to earth from their 166 days on the International Space Station, bringing the Olympic Torch back with them. 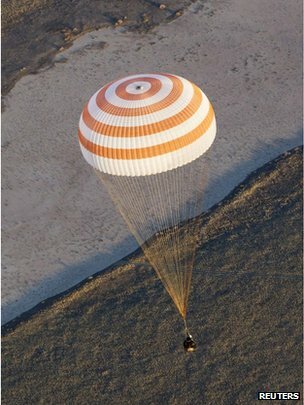 See a picture of their Soyuz capsule here: http://news.bbcimg.co.uk/media/images/71033000/jpg/_71033979_019948854-1.jpg Despite a formidable parachute and the use of landing rockets to soften the blow, the astronauts’ reconnection with the earth is by no means smooth. Luca Parmitano described the impact as the Soyuz capsule hit the ground in Kazakhstan as like “being in a small car and being hit by a big truck”. Chris Hadfield remembers the moment of landing: “One person is on the bottom, one is on the wall and one is hanging from the ceiling”. And even when they’re safely back on the earth’s surface, the adversity is far from over for the astronauts after 5 months in space. The first thing many of them notice when the hatch is first opened is the impact of the smell of the earth, the grasses and the prairie of Kazakhstan. The next revelation took Commander Hadfield totally by surprise: “I could feel the weight of my lips and tongue and I had to change how I was talking. I hadn’t realised I’d learned to talk with a weightless tongue”. The effect of living in zero gravity also means the prospect of serious muscle-loss as muscles do not have to work nearly as hard in a state of weightlessness. It must be an incredible feeling being able to fly around effortlessly, but the astronauts have to exercise for several hours a day on the Space Station to try and lessen the deterioration in their muscles and bones. For every month spent in zero-g, astronauts risk losing up to 2% of their bone mass. They can also return with puffy faces and “bird legs” as in zero gravity fluids naturally travel upwards towards the head. Even the heart has to adapt to pump blood harder in order to overcome gravity! Commander Hadfield says he felt like an old man on returning from space and for a while found it difficult to walk round corners. So, as we welcome the members of Expedition 37 back to earth, it’s worth remembering that, even if they don’t feel quite as wrung-out as Sandra Bullock at the end of Gravity, there is definitely a price to be paid for all those amazing views. © Simon Lacey. All Rights Reserved.